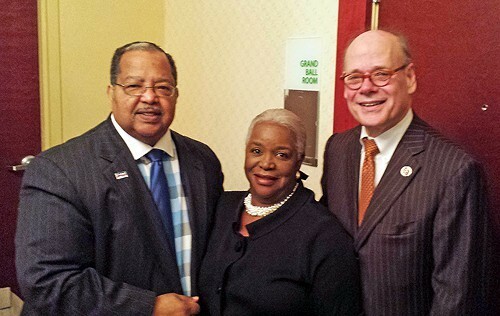 Mixing elements of lingering controversy with expressed desires for unity in 2014, members of the Memphis/Shelby County political establishment welcomed the New Year at City Councilman Myron Lowery’s 23rd annual prayer breakfast Wednesday at the Memphis Airport Hotel and Conference Center. Keeping to a stated theme of “Continuing to Move Memphis & Shelby County Forward” were 9th District congressman Steve Cohen, Memphis Mayor A C Wharton, Shelby County Mayor Mark Luttrell, and Lowery himself. In a general way, this year’s version of the annual event conformed to Lowery’s description of the annual event as “the only occasion of the year when all aspects of our diverse community can come together,” including political candidates, officeholders, and representatives of both “the corporate community” and labor. Speaking to an audience of some 300 that included numerous political hopefuls for the forthcoming 2014 election season, including his potential Democratic primary opponent, lawyer Ricky Wilkins, Cohen expressed hopes that the bipartisan bickering of recent years might ease when Congress resumes its labors later this month. He called for an increased minimum wage and cited good omens for Memphis, including the likelihood of a federal grant to aid in expanding Presidents’ Island. Cohen also noted that the much-belabored Affordable Care Act (aka Obamacare) has so far succeeded in enrolling some 2 million new sign-ups, and he expressed optimism about the future of the act, President Obama’s signature legislative achievement. Not everything said at the breakfast evoked a sense of kumbaya. The congressman made a point of endorsing host Lowery’s pending resolution of No Confidence in Shelby County Administrator of Elections Rich Holden. The resolution, a companion of one recently passed 9-0 by the Shelby County Commission, is in response to a series of glitches that have occurred in the local election process during the last few years and will be taken up at the Council’s first meeting of the year, on January 7. In their remarks, Shelby County Mayor Mark Luttrell and Memphis Mayor A C Wharton kept to the tone of general uplift and harmony, Luttrell noting the fact of frequent political controversies in 2013 and suggesting a return to genoeral “civility” as an antidote in 2014. Wharton also made an effort to emphasize the positive, including the city’s taking over management of Beale Street and the prospect of expanding the noted entertainment district all the way to the Mississippi River. "I’m through with whose fault it is,” the Mayor said, apropos his current strained relations with the Council. He pledged to make joint efforts with the Council in resolving disputes over issues like city pension reform and to get beyond the impasse over whether and for how much the city should purchase AutoZone Park. The New York company which is bondholder for the facility has threatened to auction off all or part of the property, but the National League’s St. Louis Cardinals, for whom the Triple-A Memphis Redbirds are a farm team, have offered to purchase the local team from the struggling non-profit Memphis Redbirds Baseball Foundation and to operate it themselves. The offer, though, is conditional on the city’s purchase of the stadium facility. In his remarks, Lowery referred to the recent acrimony in City Hall and made an appeal for “trust.” On the stadium issue, he revealed that representatives of the Cardinals organization will be in Memphis this coming week to speak directly with Council members about the matter.